1, PLAYER 1 STARTS WITH A LONG PASS TO NO 4 AND RUNS TO CONE A . 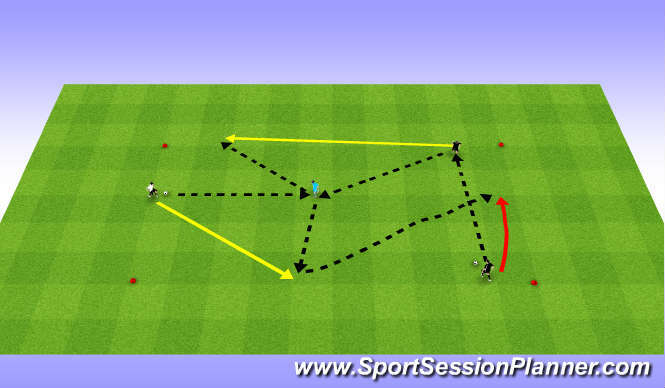 2, PLAYER 4 PASSES TO CONE A AND MOVES TO CONE B. 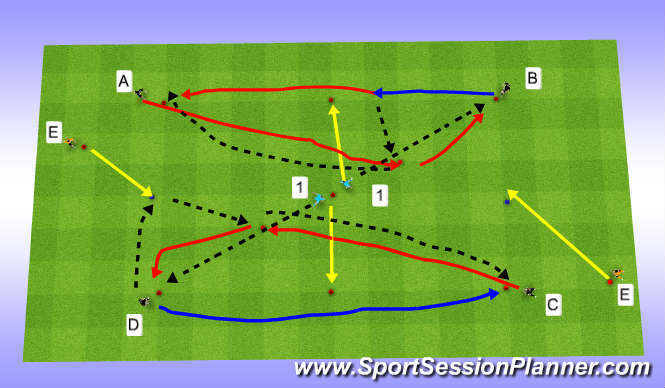 4, PLAYER 5 MAKES A RUN TOWARDS CONE C ,PLAYER 4 PASSES TOWARDS CONE C AND PLAYER 5 PASSES A TIMED BALL THROUGH TO PLAYER 1. 5, PLAYER 1 MUST CONTROL THE BALL AND SHOOT ACROSS GOAL TO BACK POST. This drill is designed to make players think about passing and dribbling . 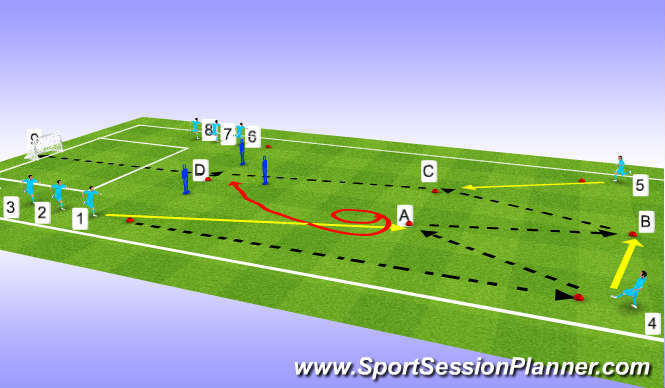 2, player B dribbles ball towards player 1 ,at this time player A runs to cone near middle of park cotrols the ball and passes the ball in front of player B and moves to cone B to start again. Target players must stay in their zones when Red&apos;s are in possession. When Blues are in possession they can join in the attack if the ball is on their side but only have two touches maximum. Red&apos;s obective is to play out of the back and score by playing into the target players. Score only counts when Red&apos;s make a pass into the target zone, support it and receive a pass and play into the same target zone or another. Once the target player receives the return pass they must pass it to another target zone before starting attacking play for the blues to score on the main goal. If the GK is not winning possession to play out of the back, refer back to the starting point to re-create repetition.